Lately I've been ordering music for my brother. When he discusses most of the groups that he likes, I'm somewhat lost since they are groups that I've never listened to. Some of the artists such as Aerosmith, AC/DC, and Kiss I am well enough familiar with to know some extent of their catalogs of works. Others like Dio, Warrant, and L.A, Guns I'd never heard actually played though I'd heard of them. My brother asked me if I like any of these artists and I told him it isn't my kind of music. These days I don't listen to music like I used to and when I do it's often classical. 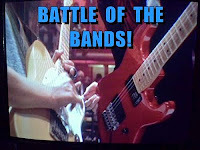 Then around the 1st and 15th of each month I listen to the song picks offered by the Battle of the Band participants. There's a wide range of musical excursions at those times of the month. In recent days I've been listening to some L.A. Guns, Dio, Faster Pussycat, and Alice Cooper. Back in the 70's I used to listen to a lot of Alice Cooper and even saw the band in concert--it was a great show. What I've listened to recently is far better than I remember. I guess that's why I liked them so much at one time. The other groups were also excellent. I've been digging listening to the digital copies of the albums that come with the CD's. I think what I said to my brother was wrong--I do like this kind of music. Not that I would want to listen to this type of music all the time, but I don't mind hearing it at all and am finding many of the tunes enjoyable. More than once have I made a judgement call about something because of preconceived notions or not giving myself more of a chance to understand and appreciate it. I'll still take classical music much of the time, but for now I'm listening to Alice Cooper and it sounds pretty good to me. As many of you have noted about your own Battles since the Battle of the Bands first began over two years ago, the results can be unexpected and sometimes very surprising. The results of my most recent Battle were just that. I was bracing myself for a brutal shut out, but you voters kept this from happening. This Battle was between two Spanish language artists performing what I perhaps audaciously suggested what might be "among the most beautiful pop songs ever written". Fortunately the song, "Mi Historia Entre Tus Dedos", was graciously accepted by the readers and even appreciated by most of those who voted. From the outset my expectation was that the sound of the duo Sergio Dalma and Vanesa Martín would be the one that everyone would readily accept while the more Latin cumbia/reggaeton sound of Los Verduleros would be rejected. I was sure wrong about this. Even though Los Verduleros were pretty far off from a win, there were still enough of you who liked their style to hand them your vote and in the end give them a respectable showing. While I enjoy the exuberant performance and lively style of Los Verduleros, I much prefer the jazzy romantic style of the duo. As Stephen T McCarthy pointed out, "How in the world Los Verduleros got it into their heads to perform THOSE lyrics in THAT style is way beyond me". That was my initial reaction, though as I pondered the motivation of an artist I can see how the lyrics could be done in an upbeat styles as the group performed them. It's not what I would prefer hearing with this song, but Los Verduleros sure make the song fun. This group would probably be highly entertaining in concert and with music like that who's listening to the lyrics anyway? As you might have guessed, my preference was the performance of Sergio Dalma and Vanesa Martín. I enjoy that jazzy style of music. The vocal interplay between the two singers gave the song the sense of being a romantic mini-drama. But even without the performance as a duo, I'd prefer the style in which they presented the song. More Battle of the Bands Coming Up! My next Battle will be appearing here on Monday February 15th. Again I will be using a thematic approach geared toward the season. Nothing dealing with romance or Valentine's Day this time. However my song picks will be appropriate in their timeliness. Oh,and the song will have nothing to do with the Academy Awards--or maybe it will in a way. 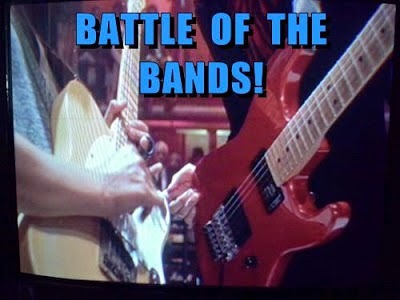 Another Battle of the Bands will be coming on Tuesday March 1st. My song choice for that Battle will be offering a prediction of the future in a dual sense. It's a song that "predicts the future" in the sense of the lyrics, but it will also offer some clues as to some of my upcoming song battles. I've got something big planned--or at least my plans include something big. Enigmatic enough for you? I'll just leave it at that and leave you guessing. My hugest thanks to Guilie Castillo-Oriard, Elizabeth Seckman, Yolanda Renee, Denise Covey. and Alex J Cavanaugh for helping to make the Lost & Found: Valentine's Edition blog hop such a tremendous success. And of course the event would have not been a success at all without all of the wonderful entries from those who participated. What a wide range of views on the topic of "Lost and Found love" and a great assortment of stylistic approaches. If you didn't get a chance to read all of the entries you can find the list of participants here. Also let us not forget the Blogging from A to Z April Challenge. In the first two weeks of sign-ups we have passed the 600 mark. You've still got several weeks to add your link to the list, but why not do it now. Start your posts now and you'll have your April blogging wrapped up before that month starts. For more information visit the Blogging from A to Z Blog. What was something that you pre-judged only to decide later that you were wrong about? Is there a type of music (food, sport, literary genre, etc) that you now greatly appreciate after finding out more about it? Are there any things that interested you in the past that you now don't particularly like? If you're interested in being part of my Arlee's Ambassadors A to Z Challenge Team, please let me know in the comments. Essentially this means assisting me with the A to Z Challenge by monitoring the sign-up list for bad links, etc and visiting bloggers who have signed up. Good show, Lee! I went with Dalma and Martin, but wondered who would win. It looked close when I checked later during last week. I can honestly add -- I did not listen to metal until one of your battles. Dixie, I'd say you're like me though in that you somewhat appreciate the metal music genre, but don't listen to it all of the time. Well I used to make fun of the Grateful Dead....any song that was over 3.5 minutes and I'd joke, 'must be the Grateful Dead'. When I actually gave their music a listen...not just the hits like Truckin....I fell in love and now they are my fave band in the world. I was very wrong about classical too. I thought it was boring. I had to take a music appreciation class in college. I was prepared to be bored. I don't remember the first piece of music the teacher played but I was hooked. I absolutely LOVE classical now. Not all of it, but a good bit. JoJo, I liked classical music when I was growing up as my parents did have some classical albums and I played some pieces when I took violin lessons. However, like in your experience, my real appreciation came in college when I took some classes that really gave me more insight as to what is was hearing and what to look for. Classical is a wonderfully diverse genre of music. I try not to judge things before I know them, but it doesn't always work. Food is something I say I won't eat once I know what's in it. But, in my defense, dishes that include snakes, crickets, scorpions, frogs, etc. just don't sound appetizing. As for music, I listen to pretty much everything. Jennifer, I would be hesitant to try things like you've mentioned, though I do have this philosophy that if I'm with others who are enjoying the food then I'll at least try it. I've actually eaten rattlesnake on a couple of occasions--not something that I especially liked, but at least I can say I've tried it. Glad you're coming around to liking some rock music again! I saw Dio in concert back in the 80's. Dude put on a great show. Alex, I've always appreciated heavy metal music, but some of the glam bands, hair bands, and certain other bands I avoided merely because of my perceptions. I'm sure Dio was good in concert. Amen, good buddy. Sometimes all it takes is open ears and an open mind to allow people to appreciate a style of music they previously believed they didn't like. It has happened to me time and again, especially in recent years. I love the bands on your brother's wish list. The v-jocks played their vids on our MTV station and I saw a Ronnie James Dio show in the mid 80s. I helped prevent a blow-out by voting for the Pride of Paraguay, Los Verduleros, but enjoyed both selections presented in your battle. The vote distribution was admirable. See you next time, good buddy Lee! Shady, once I've given a certain music genre to enter my earspace I can usually find something to appreciate about it. I may not become a fan, but I can acknowledge the skill taken to create the music. I was not at all displeased with the way my Battle turned out, but I was surprised that the cumbia/reggaeton was so well accepted. I think Alice Cooper is still making music which means you have some catching up to do. I started listening to pop music in junior high but when my cousin introduced me to Pink Floyd, I switched to rock music. L.Diane, Cooper is indeed still putting out music. Since my brother's tastes seem to be from 20 or 30 years ago or more, he doesn't seem to be too interested in more recent offerings of groups. Ohmygosh! I remember Alice Cooper, too. He's still singing? Wow! Good for him. I was a pop listener in high school, and enjoy the story-type songs to listen to now--the ones I can understand what the story is, of course. You do so much here, Lee. It is truly amazing. I so wish I had just one blog to contend with. I made my Camping with Kids and writing blogs back when blogs were about one subject. Victoria, Alice Cooper's shows were so wonderfully theatrical, but I think his image and theatrics often overshadowed the actual music. He and his boys made some excellent music. I tried to keep up four blogs but decided to cut back last year. I still do have my Wrote By Rote blog, but I'm trying to slow down the blogging to leave more time for other pursuits. I would love to help you out with the A to Z Challenge if you still need it! Allyse, great! I'll send you an email. You wrong? Naw, I don't believe it. I thought you were always right. FAE, I'm only left in certain respects, but that's not wrong nor is being right always right. Some people think I'm wrong a lot, but I think they're kind of left and in their cases wrong. What am I rambling about anyway? Lee, I went with Sergio Dalma. The jazzier version just sounded more romantic. Oh sure, there are times when I find my opinion corrected by a previous misjudgement on many things, but especially music. It's so easy to preconceive one thing to only find you're wrong. I like it when these false impressions are dispelled. Good battle. I'll be looking forward to the next one. Have a good week! Cathy, the BOTB posts have made me reconsider a lot of artists and musical styles. Glad to see you discovered some new listens. I love Faster Pussycat. A lot of hair bands do get ignored because of preconceived notions. Tia, I think for me it was image and the looks in general. That's probably been frequently case regarding hair bands. Really, "hair bands" doesn't sound that good. Maybe they were given a bad name. Having been exposed to quite a range (classical,country,Latino - even opera!) of music throughout my life, I enjoy the surprise on the faces of folks just getting to know me as much as I do sampling new sounds :-) Didn't think I would, but I really do like R&B. Diedre, we always had a wide range of music in our home and were exposed to an array of experiences by my parents. I continue the legacy of trying new things. Discovery can be such a rewarding adventure. I tend to approach country with a bias, but have found some songs I enjoy, too. Sometimes it's good to get past those biases and give something a chance. Shannon, somebody usually put some time and effort into recording whatever they did so at least we can recognize that aspect. I, too, have said I don't like a genre of music only to discover that I like some of it. Not all. And not often, maybe, but occasionally. Tastes change. Never say never! Robin, And we can like something when we're in the mood for it, but not listen to it as a rule. I'm not sure I'd say that my tastes have changed as much as they've grown and expanded. I used to not care for jazz only to really appreciate it now more, although I will never care for Diana Krall. Some of the music that I used to make fun of that my parents liked I now like (except not too much into watching Lawrence Welk...even though I have seen many shows:)) I wonder if you will be doing something related to Mardi Gras? Birgit, there's not too much music I ever made fun of or intensely disliked back in the past other than maybe country. Now it's one of my favorite genres. I guess it's a matter of listening to the right stuff at the right time. It was like they thought "Maybe I’ve begun to feel alone..." was really saying "It's fun to stay at the YMCA!" Speaking just for me, some music I simply do not like, and no amount of forcing myself to keep listening to it is going to change that. And I can think of better ways to spend my time than trying to brainwash myself into believing I like it, or searching for something, anything, that I can appreciate about it. STMcC, somewhat alluding to my previous reply to Birgit, there is no bad music if the motivation to create it was honest and sincere. There is a time, place, and frame of mind for all types of music if you're keeping a somewhat open mind. I guess if I start listening to something and start getting into it then maybe I'll get what the artist was saying. Then again, I try to see the positive side to a lot of things. You and I voted the same for this one in case you didn't notice. Yeah, I noticed. In fact, you and I voted the same on many Battles this time. That really stood out to me since ordinarily we vote alike on maybe one or none. Must be the end of the world as we know it... and I feel fine. STMcC, end of the world would have its plus side. I wouldn't have think about finances anymore and I'd be moving to a nicer neighborhood. I used to be very into rap and hip hop back in the hey day of Tupac, Puff Daddy and Biggy. But some time after that I just did not enjoy what was coming. recent years there have been a few artistes but my fave music genres now are Rock/Punk Rock, Pop and Alternative. Glad the bloghop went well Arlee. Sheena-kay, I haven't delved too far into the world of rap and hip-hop though again these are genres that I have a lot of preconceptions about. I avoid stuff with a lot of bad language and material that I'm not interested in hearing. But I've also heard some music in the genres that I've liked a lot. I do enjoy music even if I don't listen to it as much as I used to. Good stuff! It is strange what music you used to like, did not like and like become. Mike, if I liked certain music once there must have been something of merit in it that would make me like it again. Sometimes my musical tastes runs in cycles of phases. Great post Lee, and I had the winner this time. Yvonne, you're good at picking winners. Until I started working in the public sector in the mid-90's, I dismissed roughly 95% of the music out there. Then, a co-worker turned me onto college radio and opened my eyes to the vast horizon of almost every conceivable sub-genre known to man. I often say that because I've listened to so many different types of music that there's really nothing my two kids (15 & 23) can play that would offend me. Except the current slop that passes for pop music. GB, college radio has certainly expanded my musical horizons. I even like a lot of the pop slop. That was a good showing after you were expecting a shutout! So many different tastes out there. I can't handle the screaming heavy metal/death metal stuff. I've tried and I just can't tolerate it. It hurts my ears. I dig classical once in awhile but it's definitely not my Go-To. I used to say I hated Country but I love today's Country and find myself listening to it all the time when I'm driving around! Michele, if the music gets too thrashy and cacophonous then I can't usually handle it. Much of today's country is basically the country rock I used to listen to in the 70's. Laura, I haven't seen Wizard of Oz in many years, but do have a copy on DVD. Over the years I've seen it many times and I still claim it as one of my favorite films. So far, I've selected all the winners this time. Which is great considering I've been on the losing side for far to long. I'm always in the minority, lately anyway. I've been running out of time and have been unable to do more than the usual blog posts. I'm hoping I can free up some time soon. Really looking forward to the A-Z challenge. I'm going to be busy one of the weekends, so I may have to do a few blog posts in advance for that. Especially if I want to include a second blog. Something I'm still pondering. April is going to be a busy month for me. Jeffrey, you should definitely do your April posts ahead of time--or at least as many as you can. The advance work takes a great burden away that allows you more blog visiting and networking. Good music, is good music, is good music. I have to say that I don't really favor (and never have) any particular type of music. Although I don't get over here often Lee, I appreciate that you expose me/us to music that we are not always familiar with. Pat, I've always enjoyed sharing music discoveries. I think most of my friends would agree to that though they didn't always appreciate everything that I shared with them. Sometimes I'm still surprised I became a Duranie (a Duran Duran fan) coming up on five years ago. Valentine's Day will be my fifth anniversary of officially converting to a fan. I always loved Eighties music, since that's the decade of my childhood, but I never dreamt I'd fall so in love with a band who actually got famous in my own lifetime! I thought they were like the Eighties version of NKOTB or N'Sync, and couldn't have been more wrong. Carrie-Anne, there have been a number of artists that I've discovered after their initial burst on the pop scene. I like Duran Duran's music though I did kind of look down on them at first. I thought I hated rap when I first heard a couple of "songs," but since then I've learned to enjoy some performances, especially those that combine rap segments with regular song elements. The think a few of the songs on the TV show "Empire" helped alter my listening pleasure. Patricia, me too. There is still some rap I can't tolerate, but when done for the sake of creating good music some of it is quite good. I try to be open-minded about most things because I want my kids to be. I'm not a huge fan of twangy country, but I'll listen if someone has something to offer. Sometimes I don't like it, sometimes I do. Hopefully my kids will be willing to listen when they have the opportunity. Lori, I'll listen to anything and as long as it doesn't offend me in any extreme way then I'll keep listening. I hear you about the music. My husband gets tired of music fast, so he's always switching it up. About the only thing he's stayed away from is Jazz. He keeps me open minded. I wasn't always that way--especially with food. Thank goodness I had my hubby while we lived in NYC. I would have totally missed out. Crystal, I love trying new restaurants and other adventures. It can be a great learning experience. Always good to rediscover music! I'm still working on that Manhattan story for you- typing it into coherent thoughts instead of fireside rambles. Looking forward to being on the team again. It was great fun last year. J, it's a thrill for me to come upon music I previously dismissed to realize I actually kind of enjoy it. I look forward to getting your story.